We are very pleased to announce that Midwest Trail Ride is our EasyCare Dealer of the Month for December. Midwest Trail Ride is located at 1264 Hunter’s Creek Road in Norman, Indiana, and their campground is located in the Hoosier National Forest in beautiful southern Indiana with access to over 100 miles of well marked trails. These trails will take you through some of the most beautiful scenery that Indiana has to offer. They have 108 electric and water campsites, 13 cabins and 385 horse stalls and are open everyday from April through November for open camping and/or organized rides. Midwest Trail Outpost Store specializes in “trail rider’s” gear and many unique things you don’t find at other tack stores. Kim, the owner, is a trail rider and is constantly looking for quality products to share with customers and friends. Midwest Trail Ride Outpost is a trail rider's headquarters. They stock English & Western trail saddles, gaited horse saddles, Western & English bridles & halter bridles. They also stock outback dusters, winter liners & hats, art work, jewelry and hard to find, unique gifts for the equestrian. And, of course, they stock many styles of EasyCare Hoof Boots. 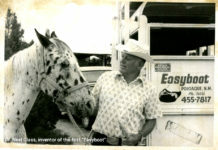 Midwest Trail Ride Outpost has carried Easyboot styles since 2007. They carry the Easyboot Glove, Trail, and Back Country. 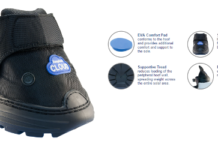 Kim says that their best selling boot is the Easyboot Trail, but her personal favorites are the Glove and the Trail. Kim's horse wearing Easyboot Gloves. Kim says that they custom fit hoof boots to the horse and educate riders about them. She told us that they don’t really advertise for hoof boots, folks just come there to ride and realize that they need hoof boots for their horses. Kim and her staff offer to fit the boots for each customer. 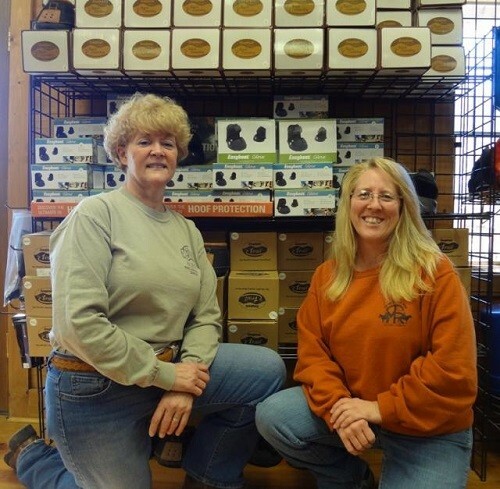 Kim states, “When we decided to carry the hoof boots, I went shoe-less and used only boots on my own horses for a couple of summers to check out the pros and cons of boots…so I could honestly tell customers my opinions. We are successful because we let the customers try the boots on and we make sure the boots are a good fit before they leave with them. I decided when we went into this business that I wasn’t carrying things in my store that I don’t like or believe in." 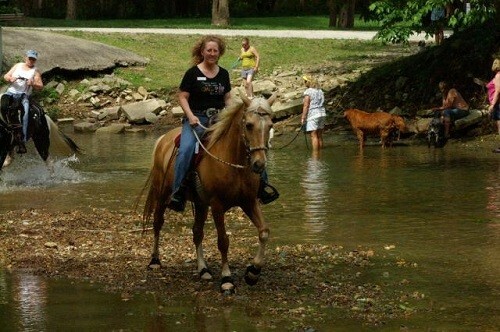 Kim has ridden horses for over 30 years, trail riding, showing and some endurance. She has a degree in Equine Science at St. Mary of the Woods College and a business degree from Oakland City University. Kim owns seven horses, some of which have been booted for about four years. Kim feels that more people are using boots as an option then ever before. She says that folks are really exploring this option, once they are educated. Lisa and Kim in front of the EasyCare display. Midwest Trail Ride Outpost also has a farrier that works with them. 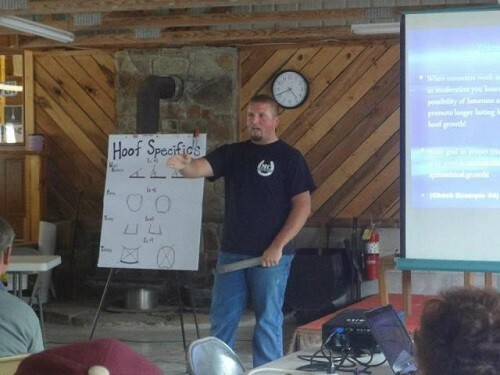 Matt is educated in farrier science and goes to school for continuing education every year. 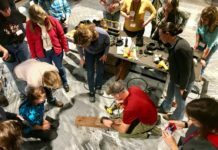 Matt helps to educate customers and, if their horse can’t be reset because of a damaged or unhealthy hoof wall, he will suggest hoof boots to the customer so they can continue to trail ride and enjoy their horse while the hoof wall is heeling…some folks don’t go back to shoes. 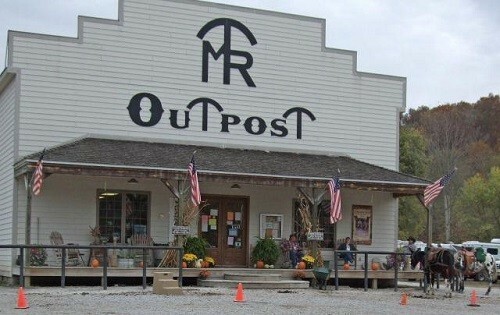 Visit Midwest Trail Ride Outpost at their store, on their website or "Like" them on their Faceboot Page.